Here are 6 beautiful gardens filmed by drones. These beautiful garden videos are from Washington, Rome, Netherlands, Singapore, Israel and Ireland. There are perhaps thousands of great gardens on this planet with Earth itself being the greatest. Below is just a selection of best drone videos of gardens filmed at the moment. Over the coming years we will see plenty more. Drones really are versatile with so many helpful uses. When viewing these videos, you can see how drones greatly assist with surveying the progress of garden landscape projects. Drones help the Landscape Gardener with the topographical features and aspects of design such as steep slopes, vistas, hills and outcrops etc. The aerial view also give tremendous feedback on the look and feel throughout the project. Over the next few years, I think drones will become very important to landscape gardeners. 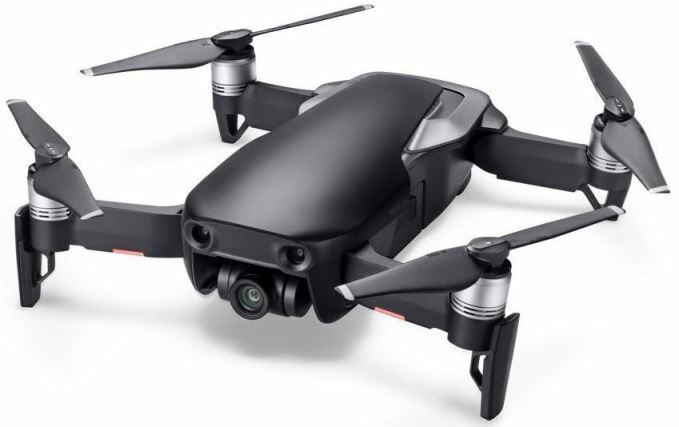 Drones are a terrific tool for marketing and advertising of tourist and outdoor destinations such as gardens, hotel resorts, golf courses and lake fishing etc. You can see why. With the latest drones, you can create beautiful aerial videos using relatively inexpensive drones. Lets take a look now at some beautiful gardens. The Villa d’Este, in the town of Tivoli east of Rome, is one of the most beautiful gardens in Europe and is listed on UNESCO’s World Heritage List. The villa was built in 1560 and was the vision of Cardinal Ippolito II d’Este. The villa is famous for its magnificent garden of grottoes, fountains, nymphs and water sculptures. This drone video was taken in March 2014. If this video was taken today with the latest DJI Mavic Pro, Phantom 4 Pro, the Inspire 1, or Inspire 2 you would not have any fisheye distortion which we can see in this video. This is still a beautiful video. The gardens are a real treasure. The Keukenhof gardens in the Netherlands is absolutely special. On arrival in spring time, your senses will be filled with more than seven million tulips, daffodils and hyacinths. Color and fragrance across 32 hectares like nowhere else. Each year the park attracts more than 800,000 tourists from all over the world. 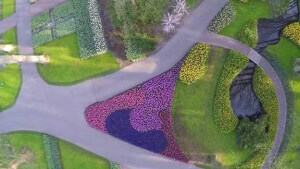 This unique aerial video shows some of the highlights from the park, including the 2015 flower painting of Vincent van Gogh, a typical Dutch drawbridge, the central lake & fountain, and numerous flower beds. 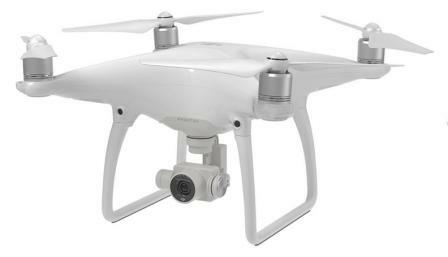 The drone video was shot using a DJI Phantom 2 quadcopter, Zenmuse H4-3D gimbal and 4K UHD video camera. The Marina Bay Garden is one of Singapore’s hottest attractions. It is a multi-award-winning horticultural mega project featuring 50-meter-high solar powered “Supertrees” and climate controlled Biomes. The Gardens consist of three waterfronts built on reclaimed land. The Bay South Garden alone is estimated to have cost more than S$1 billion ($720 million). The 54-hectare Bay South Garden, which is the main garden, features cooled flower domes, multiple heritage themed outdoor gardens and two lakes. Totally WOW. This amazing Singapore Marina Bay garden was filmed with the professional DJI S1000+ drone mounted with a Canon 5D Mark III and Zenmuse Z15-5D III gimbal. The Bahá’í Gardens in Haifa, Israel is a holy place and a major tourist site. The garden terraces are located around the golden-domed Shrine of the Báb on Mount Carmel. The staircase includes nineteen extremely beautiful terraces, extending almost a kilometer, covering about 200,000 square meters of land. The gardens include works of stone and metal as well as fountains and green expansive lawns. The garden overlooks the panoramic views of the city, the Galilee Hills and the Mediterranean Sea. What a great place for a picnic. Wicklow has mountains, wild Irish coastline, country estates and 80 miles (129 km) of walking trails. Within the National Park are glacial lakes, rivers and Glendalough, the remains of an early-medieval monastic settlement in a forested valley. Wicklow is also home to some of Ireland’s most beautiful gardens. You have the world renowned Mount Usher, the National Botanic Gardens at Kilmaccuragh, Killruddery Gardens and Powerscourt Gardens, voted third best garden in the world by National Geographic! Here are some of the best drone shots from around Wicklow. The Reserve’s 150 acres are a unique blend of natural woodlands and beautifully landscaped gardens, including a Japanese Garden, a Moss Garden, a Reflection Pool and the Bloedels’ former estate home. Enjoy this drone video of this absolutely stunning garden.